William J. 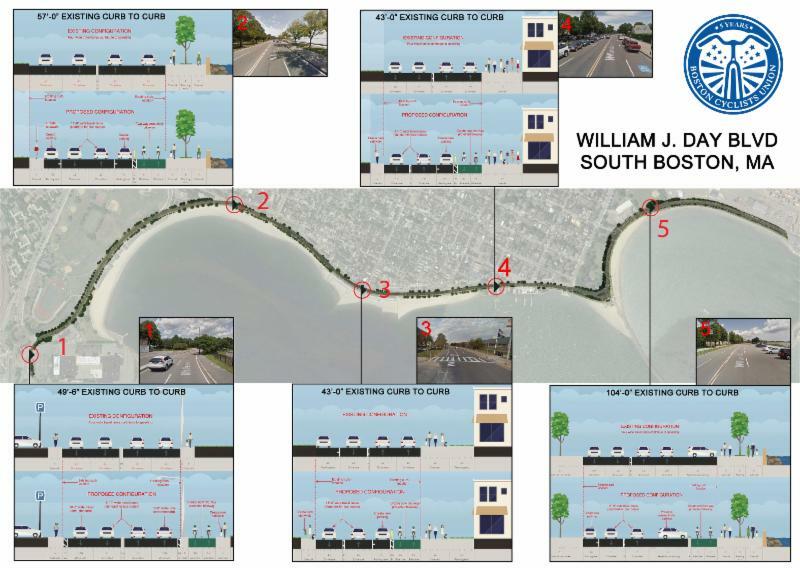 Day Boulevard in South Boston is unsafe for pedestrians and cyclists, according to a road safety audit, and changes are coming to address that problem. What those changes will look like is now up to you, as the Massachusetts Department of Transportation (MassDOT) and Department of Conservation and Recreation (DCR) are seeking public feedback on what safety improvements residents would like to see on this arterial roadway. Tell MassDOT and DCR to include protected bike lanes as part of this plan to modernize and improve Day Blvd! Send an email or call today to ensure they know there is support for these changes! In short, the audit concluded there is too much space given to cars, but none given to cyclists. An obvious solution: Replace some amount of space now devoted to vehicular traffic with a protected bike lane. As the audit notes, under the current configuration cyclists often choose to ride on the broad sidewalk due to unsafe conditions on the street. Although there are no restrictions against biking on the sidewalk, it’s an inapt place for cyclists, as it’s filled with foot traffic including dog-walkers, rollerbladers, families and the elderly. Adding a dedicated, protected bike lane would improve conditions for all users by reducing mode share conflicts. DCR has funding to make Day Blvd. safer, and plans to soon begin implementing short-term fixes while collecting feedback on longer term plans. 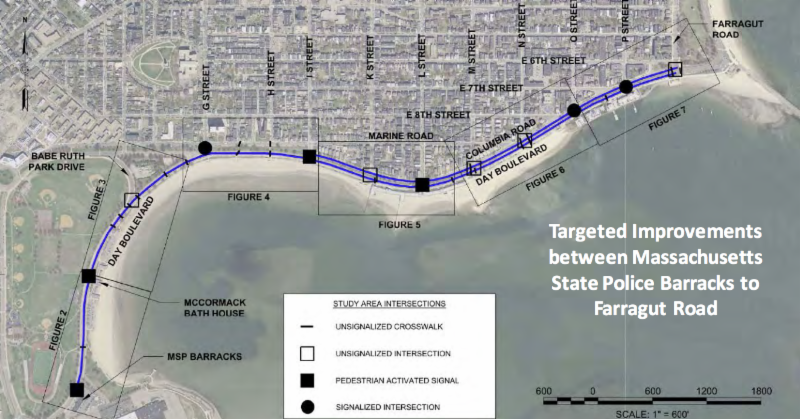 The safety audit already singled out bike lanes as a viable, impactful improvement, but we need DCR to understand just how impactful this development would be to residents and people who travel this corridor. DCR needs to hear from you! I look forward to seeing your comprehensive plan for improving Day Blvd., and to seeing these improvements put in place as soon as possible. The planning team needs to hear from you before August 15th to incorporate comments before coming back with a plan in September. So don’t delay: Submit your feedback today, and ensure MassDOT and DCR understand there is robust support for implementing protected bike lanes on Day Blvd!